The Central American rain forest canopy teems with red-eyed tree frogs, a species that relies on bold coloration for survival. Access to water is essential for amphibian reproduction, therefore red-eyed tree frogs usually make their homes near rivers or ponds. 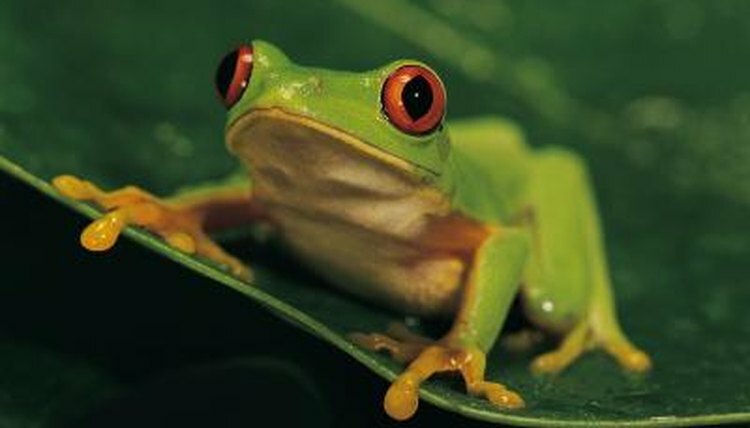 The International Union for the Conservation of Nature considers the red-eyed tree frog a species of least concern, in part because it thrives even in rain forests that have been disturbed. Aside from two crimson eyeballs that threaten to pop out of their sockets, the red-eyed tree frog is predominantly neon green, with blue and yellow pigmentation on its sides and legs. The throat and belly are white and the feet are either orange or red. Females are about 3 inches long, while males have a maximum length of around 2 inches. Unlike other species of bright rain forest frogs, which secrete toxins that deter predators, for the non-poisonous red-eyed tree frog, pigmentation is the only form of defense. During the day, the frog settles down to sleep by attaching itself to the underside of a leaf with the help of relatively large toes that function like suction cups. It sleeps with its eyes closed and limbs pulled in so that only the green portions of its body -- those that camouflage it against the leaf -- are visible. If approached by a hungry snake or a bird, the red-eyed tree frog will open its eyes suddenly in an attempt to stun the would-be predator. If successful, such a display, called startle coloration, may buy the agile red-eyed tree frog a few seconds to escape. An ambush feeder, the red-eyed tree frog hunts at night. It conceals itself in the rain forest canopy and waits for its insects of choice -- crickets, moths, flies and grasshoppers -- which it captures with the help of a tongue that is as long as it is sticky. Red-eyed tree frogs will also eat smaller frogs. Like many frog species, red-eyed tree frogs procreate through a process known as amplexus, in which the male attaches himself to the female's back and fertilizes her eggs as she expels them. Mating pairs are established in a ritual that begins with male frogs producing a cacophony of croaking sounds to attract females and claiming territories by jumping from one leaf to the next. When they spot a female, males fight to climb onto her back. When one succeeds, he clings onto the female until the clutch of eggs is laid. Amplexus occurs on the underside of a leaf hanging over a body of water. When the eggs hatch, the newborn tadpoles slide down the leaf into the water below. What Is the Purpose of a Frog's Third Eyelid?